Is LC/MS right for you? Find out. Without question LC/MS will be come one of the essential tools for solving problems in chemical analysis in the decades to come. A Global View of LC/MS is your guide to learning, acquiring equipment and making the right choices in LC/MS. This guidebook is your primary resource for successful LC/MS. 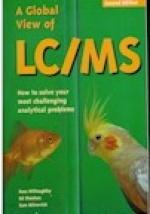 Whether you are a newcomer, teacher, manager, practitioner or organization engaged in LC/MS, you will refer to this book again and again. "From Journal of American Society of Mass Spectrometry" ... is a well-done long-overdue book that has something for everyone who is involved with LC/MS: management, scientists and technicians... is a good handbook, reference source, course book and general read. ..it will become "well read" quickly.